Stockings are so fun, right? I mean not only do you get presents to open but a whole sock of more goodness to sort through! Although I give my kids just a little candy in their stockings, I try to steer clear of too much sweetness and too many dinky little toys that will just end up broken or taking up space in their toy box. That’s a waste of money, in my opinion. Instead, I try to find little things to make them. My kids love it when I make them something and usually utter a heartfelt, “Thank you” which makes my heart melt. 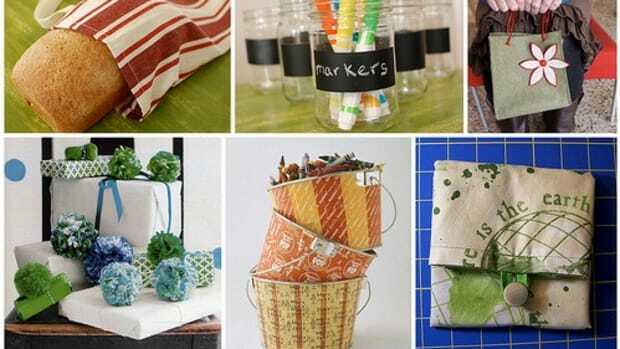 Below are my picks for stocking stuffer ideas. 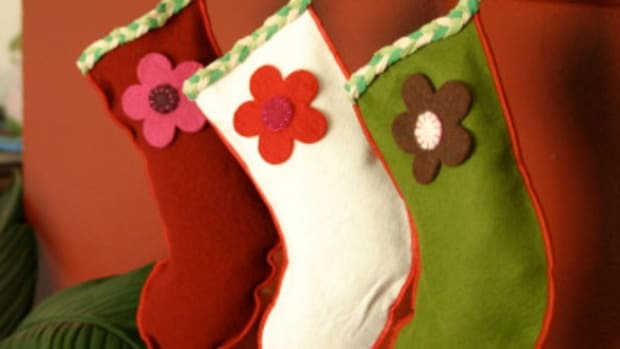 And if you’re interested in hand making stockings this year, check here for all sorts of fabulous stocking ideas! Butterflies – I recently made these to go in the goodie bags at my daughter’s 6th birthday party. They are fabulous because they knit up so fast and are so versatile. I sewed them onto hair ties. They could also be made into little rings or bracelets! 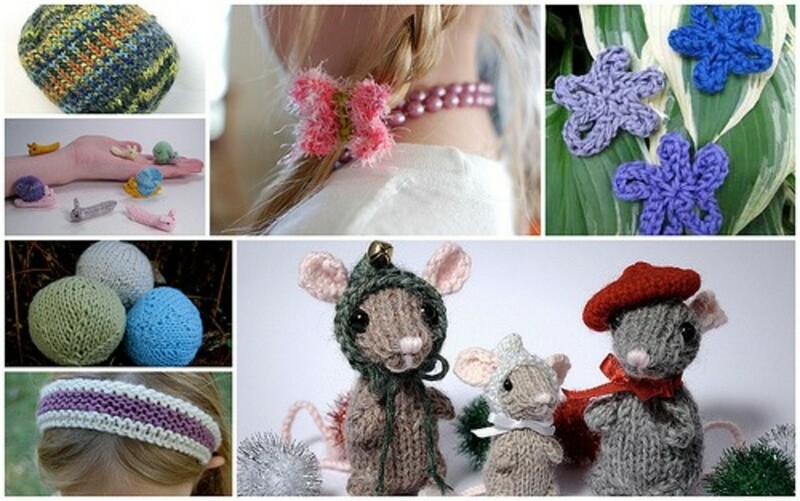 Flowers in Bloom – I just love these little knitted flowers. Glue them onto a hair clip or a shirt pin and your girlie has an easy hair tie or accessory for all her dress up needs! Sassy Frass Hair Band – This was an inspiration that came one Mother’s Day as my girl and I were out for a ladies brunch. She wanted a hair band but I couldn’t find one that I liked nor that I thought was a good price for what you were getting. So I came home and the sassy frass hair band was created. Soft Balls – For the younger little man in your life these are perfect for playing in the house. Hacky Sacks – And for the older one, a hacky sack to play outside! Holiday Mice – These little guys are cute and small enough to go right into a stocking! Lauren Woven Belt – This free pattern from the Handmade Underground Knitwearwould be a lovely addition to any woman’s wardrobe, sure to get a few, “Where did you get that?” from all her friends. 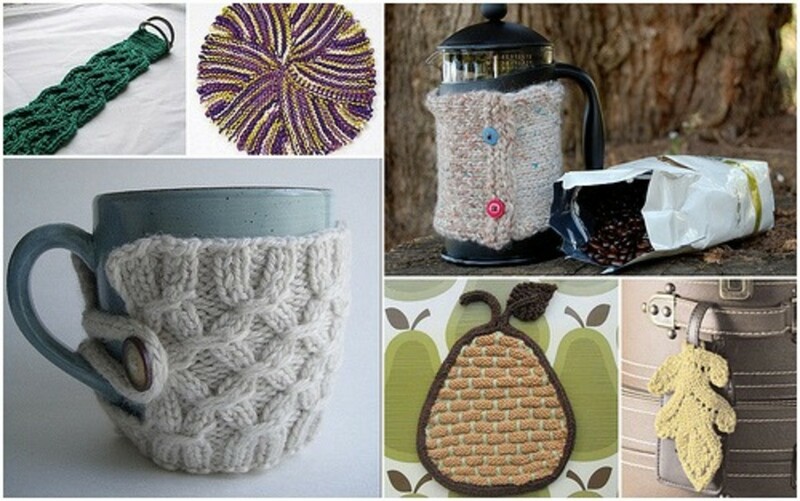 Mug Cozy – Is there anything worse than a cold cup of coffee or tea? Slip this mug cozy into that stocking for a gift that will warm the heart! Dishcloths – I absolutely love a great knitted dishcloth made out of organic cotton. They’re soft, they’re durable, and they’re handmade! Some I’ve been eyeing this year are the Baby Fern Dishcloth, Picot Swirl Cloth, and the Per Orla Dishcloth. French Press Cozy – Some people prefer a coffee pot, some a french press. My husband is in the second group. Being that a french press doesn’t have a warmer underneath it to keep the java warm, I made him a cozy to give the coffee a little more time of warmness. It’s small enough to be an excellent stocking stuffer! Traveling Oak Leaf – We’re a family who likes to travel so these would be perfect! A free pattern from Knitting A Kiss In Every Stitch, these travel tags would surely set your luggage apart from the crowd. Tooth Fairy Bags – If you have kids who are close to the losing tooth (or right in the middle) stage, then these would be perfect! Only simple hand sewing is required. And these could easily be adapted to a bag other than a tooth fairy bag! 5 Minute Hairkerchief – I love these little hairkerchiefs! And in only 5 minutes you can have another great little gift that will please your little girl! 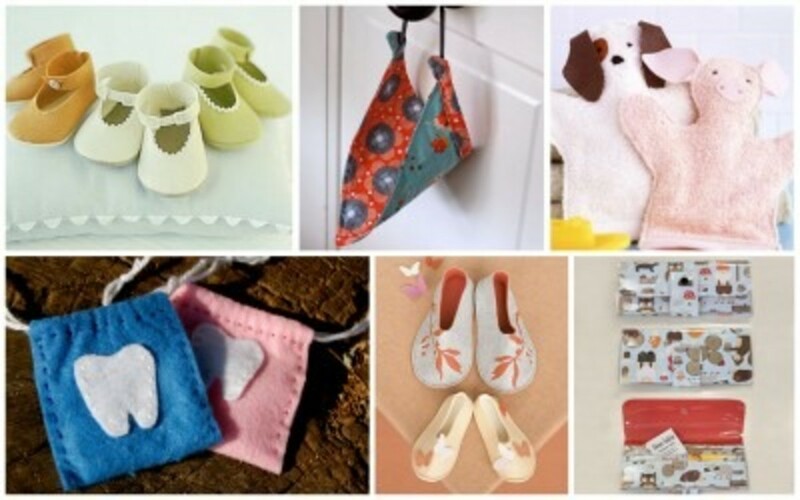 Felt Baby Shoes – These are adorable! Slip these into baby’s stocking and wrap up a dress to go with them! Make some slippers for the older kids in your family. Washcloth Puppets – Lots of fun for the kids! Paper Vinyl Wallet – Choose your paper to make this a cute wallet for the kids or an adult wallet for the grown-ups! 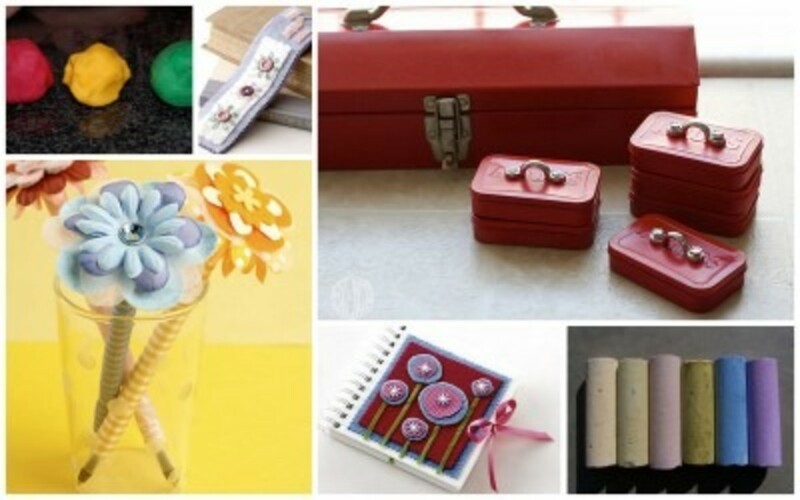 Felt Sewing Book – This is a cute little book to hold all your sewing needs. Perfect for fixes when you’re away from home! Add these leaf notions to keep all your tools handy! Sachets – I love a good scented sachet to put in my drawer! 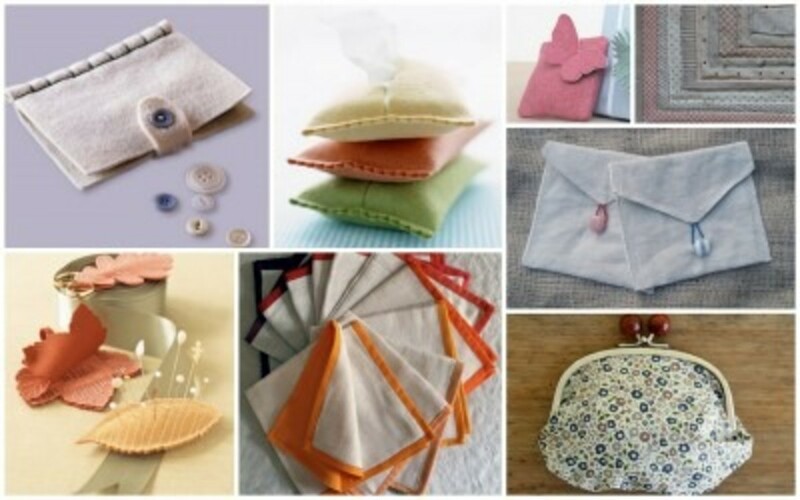 Tissue Cases – These are perfect for holding tissues in your purse! Linen Napkins – Love them! Rolled Hem Handkerchiefs – My husband loves having a hanky in his pocket! Sidewalk Chalk – You can never have too much sidewalk chalk! 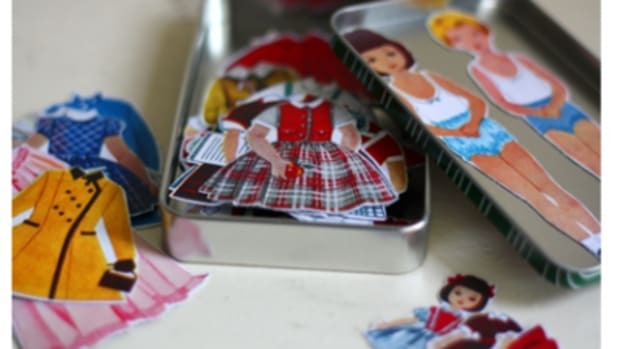 Altoids Tool Box – Isn’t this the cutest? This is perfect for any boy to hold all his treasures he collects along the way! Play Dough – Everyone loves play dough. I love homemade play dough because I think it’s softer than the store bought. The added bonus is you know without a doubt that it’s non-toxic! Personalized Bookmark or Beaded Bookmark– I love that my kids read regularly. Make your kids personalized bookmarks so they can always find their place! Journal – My kids are always writing, drawing, or coloring in notebooks! Personalize one of these for a boy or a girl! You might even want to make a cheery pen to go along with the girl version! Duct Tape Wallet – These are the bomb! Fill it with pictures and the man in your life will absolutely love it! Felt Coasters – Easy and perfect for setting your drink on! 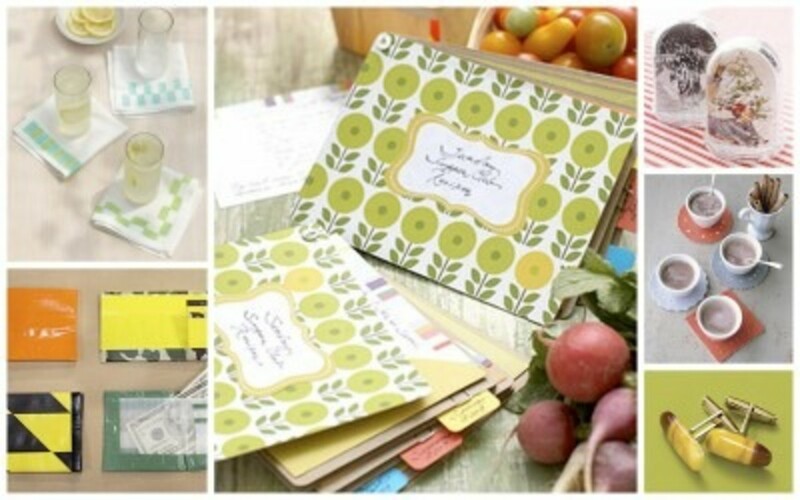 Fabric Napkins With Stamp Borders – Simply buy cloth napkins and stamp a border around the edge! Snow Globe – I know some people collect snow globes. How fun to make a personalized one! Custom Cuff Links – Add a personal touch to some handmade cuff links! 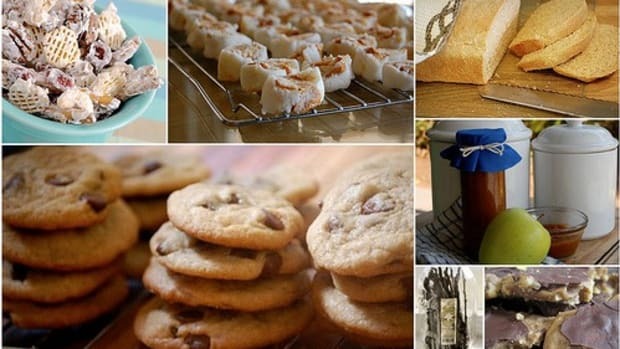 Handmade Recipe Book – Put together a collection of all your favorite recipes! This is a very small list compared to what’s out there! Do you have any favorite stocking stuffers you would like to add to the list? Note: This post is part of the Creative Christmas series. 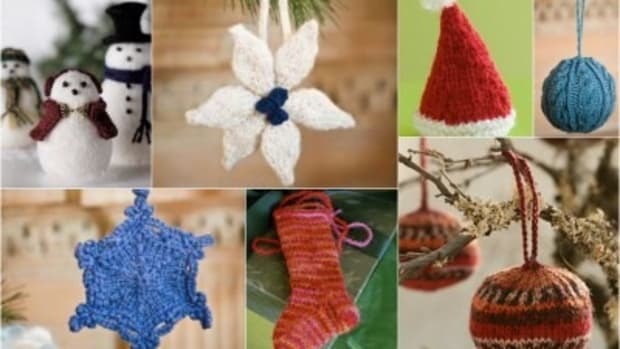 Check out Creative Christmas :: Ornaments for handmade ornament ideas. Next up in the series is Christmas Gift ideas! Please note that pictures used in this post were used by permission and belong to the people who I’ve linked up with. For more posts written by me, visit my personal blog, I Believe In Love. I remember growing up with all kinds of handmade ornaments on our tree. 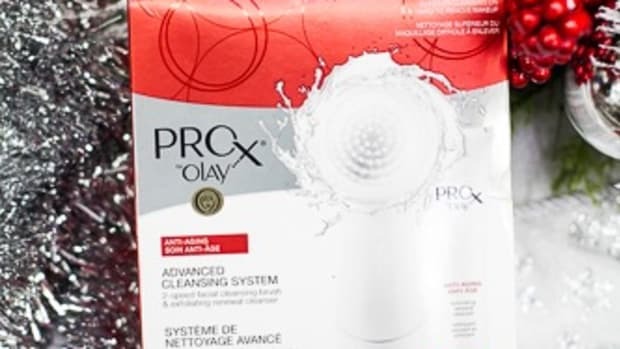 This post was sponsored by Olay and Braun at Walmart. All opinions are my own. Don't throw the towel in on stocking stuffers. 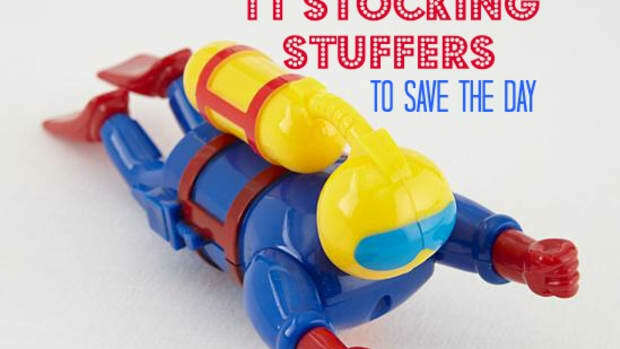 Here are some ideas to get your stockings stuffed -- for kids and adults. 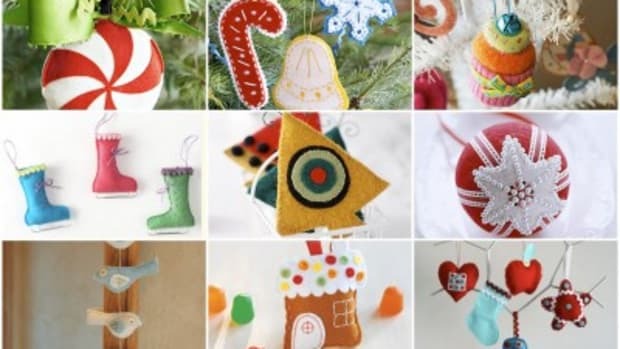 Jen Price shares a wonderful round up of handmade ornament patterns from around the web.